Winners in the ninth annual Stevie® Awards for Sales & Customer Service, recognized as the world's top customer service awards and sales awards, were unveiled on Friday night at a gala ceremony in Las Vegas, Nevada attended by more than 520 executives from around the world. 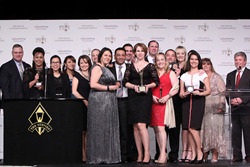 DP DHL, with Gold, Silver and Bronze Stevie Award wins for operations in Bolivia, Mexico, New Zealand, South Africa, Thailand, the U.S.A., and other nations, won the Grand Stevie Award as the winningest organization in the competition for the second year in a row. Other organizations recognized with Grand Stevies for the overall quality of their nominations and the total number of awards won include Delta Air Lines, DenizBank A.S., Fareportal, GuideWell Connect, John Hancock Signature Services, Lennox Industries, Marriott Vacation Club, Visualize, and VIZIO Inc. Among the winners of Gold Stevie Awards, Turkey’s DenizBank was the top individual winner, with six Gold wins, while various DP DHL locations worldwide won a total of seven. Lennox Industries, Marriott Vacation Club and VIZIO won three each. Winners of two Gold Stevies include Blinds.com, Cisco Systems, Competence Call Center, Delta Air Lines, Fareportal, FedEx TechConnect, HomeAway.com, HomeServe USA, iHeartMedia, Invenio Solutions, Kohl’s Department Stores, Trupanion, United Credit Consultants, Wells Fargo, Xactly Corporation, and Zions First National Bank. Winners in the sixth annual People’s Choice Stevie® Awards for Favorite Customer Service, as determined by a worldwide public vote, were also awarded at the event to organizations including AllClear ID, CubeSmart, Rackspace, and Turkey’s Avea Iletisim Hizmetleri A.S., among others. The presentations will be broadcast by the Biz TalkRadio Network (http://www.BizTalkRadio.com) at 7:00 pm ET on Monday, March 9. The awards are presented by the Stevie Awards, which organizes several of the world’s leading business award shows including the prestigious International Business Awards and the new German Stevie Awards. More than 1,900 nominations from organizations of all sizes and in virtually every industry were evaluated in this year’s competition, an increase of 27% over 2014. Finalists were determined by the average scores of 139 professionals worldwide, acting as preliminary judges. Entries were considered in 54 categories for customer service and contact center achievements, including Contact Center of the Year, Award for Innovation in Customer Service, and Customer Service Department of the Year; 50 categories for sales and business development achievements, ranging from Senior Sales Executive of the Year to Business Development Achievement of the Year; and categories to recognize new products and services and solution providers. The Business Development categories were new for 2015. Members of seven specialized judging committees determined the Gold, Silver and Bronze Stevie Award placements from among the Finalists during final judging that took place January 26 - February 4. Sponsors and supporters of the 9th annual Stevie Awards for Sales & Customer Service include Biz TalkRadio and ValueSelling Associates.